What is really fascinating about today's threat from Mgr Pio Pinto is what it says about him and those for whom he so obviously speaks. 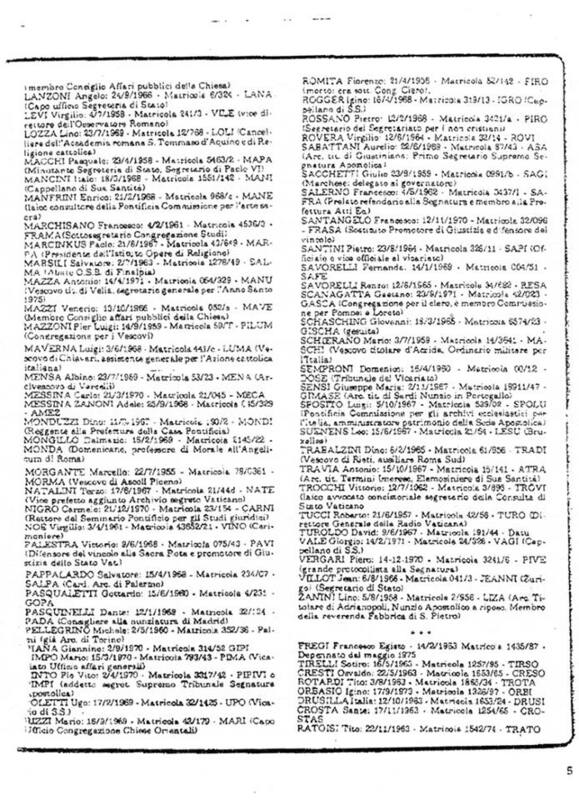 As it so happens, Mgr Pinto is named in a website claiming to reveal members of the Hierarchy who are Freemasons - I have no idea whether the site is credible or the list true. However, it is quite an allegation that someone has made in the public domain so would he care to answer a 'Yes' or 'No' to the question: 'Are you a Freemason?' Or has he already answered the question 'in a round about kind of way' throughout his ecclesiastical career? For clear answers of a 'yes/no' variety seem to be such a rarity from Rome nowadays. But I digress: Much is revealed about Mgr Pio Pinto's psychology (or the psychology of whomever put him up to it) when he issues such threats against Cardinal Burke and the four Cardinals in general, claiming that they could be stripped of their cardinalate should they continue their questioning of the Pope or 'move forward' with their promise to take further action. 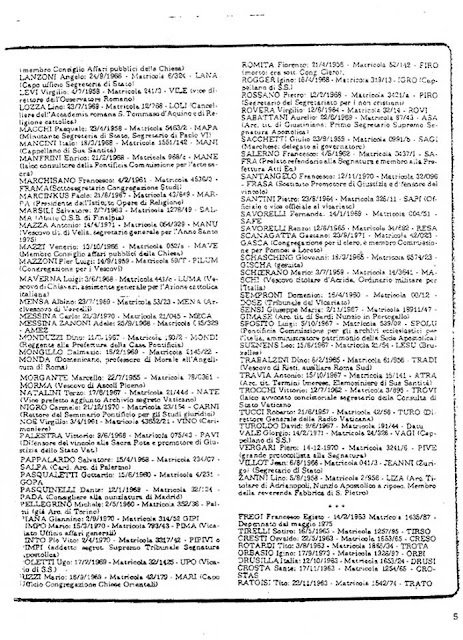 An alleged list of members of the Sacred Hierarchy of the Church who are Freemasons. Mgr Pinto - or whoever put him up to it - quite shamelessly assumes that these Cardinals are motivated by the rank and authority, title, privilege and status to which they have risen in the Church. Why would he or whoever put him up to it do that or think in that way? 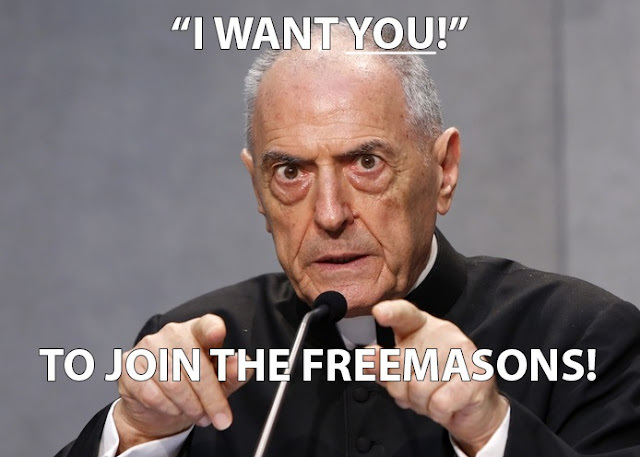 Well, quite naturally - though such naked ambition is always unbecoming of a prelate, for I believe His Holiness called them 'ladder climbers' or 'careerist bishops' or some similar insult, it does happen that people angle themselves for promotion within the Church and prize that above the important things - like remaining faithful to the Truth of Christ and service of Him in His Holy Church for the salvation of souls. ...believes that Cardinals Burke, Meisner, Caffara and Brandmuller fall into this category of prelate, thinking that, because that is (quite clearly) the way in which he - or they - or whoever put him up to it thinks, that such is how the faithful four think. I don't obviously know the hearts and souls of Cardinals Burke, Meisner, Caffara and Brandmuller, but I just imagine that somebody has made a massive miscalculation and into the bargain has revealed the real intentions of the heart of either himself or whoever has put him up to it. Benedict XVI saw authority in the Church as a gift to be used in the service of Christ, in the service of Truth, in the service of God's people, in the service of the Church. Benedict XVI did not see the papacy - even the papacy - with its extraordinary privileges in terms of power, but pointed to the Crucified Christ who emptied Himself out of love for us. Only those who believe that their position and vocation in the Church is about power and influence for its own sake would assert the withdrawal of rank and privilege as a real threat to those who question the Pope on faith and morals, when teaching on faith and morals is his very duty as Supreme Teacher of the Faithful. Further, if this were being considered by the Supreme Pontiff who is, according to Cardinal Hummes, ever serene and 'moving forward' then not only is this a threat that could - for even Popes are prone to human error and poor judgement - backfire catastrophically, but one that he may be forced to act on because the threat has not been taken terribly seriously. If the threat is seen in terms of 'God or Nothing' then it is a threat that will be treated as something to be taken in the stride of those who are faithful to Christ, something which history documents has been costly to ecclesiastical careers, yes even within the Church. St Athanasius, after all, was exiled for standing firm! Quite simply if these four Cardinals or 'persons' really believe that remaining faithful to the Truth of Christ come what may - then this threat, sorrowful as its consequences would be for these men - would not be deemed terribly important. That's quite a gamble when you are dealing with men who, unlike the Pope's mischievous minions, take Jesus Christ very seriously indeed. I just don't see how the Pope could still retain his waning reputation as merciful or pastoral or humble or fraternal or'in the spirit of dialogue or whatever kind of vacuous, platitudinous phrase is currently circulating in the papal lexicon, should he decide to press that button. Creating martyrs - real Christian martyrs - may not be such a wise move by His Holiness. He should perhaps consider the implications of such a move before permitting his Dean of the Roman Rota to publicly suggest such an idea, or, having permitted it to occur, restrain him, perhaps even publicly. The Pope has more to lose in the public eye than do those who he could sanction and publicly strip of their rank and status. But I suppose that the more silent is the Pope on the dubia, the more questions arise over his pontificate. the less he is able to maintain unity in the Church under Peter, the more anxious will become those who wish to, by hook or crook, disavow the Teachings of Jesus Christ. Yes, the way is being paved for apostasy in Rome. No, many people, including some bishops and Cardinals, will not remain silent in the face of evil. There are real consequences to threats. There are real consequences to actions. Those consequences will not - I suspect - leave Pope Francis looking good any longer. Having asked unanswered questions, these men have simply brought the issue to the assembly because they believe - rightly - that it is the Church's business to know. Thank God for these wise and brave men who - I believe - are not ashamed of Christ, nor afraid to 'suffer humiliation for the sake of the Name'! I am hopeful that His Holiness Pope Francis and the Four Cardinals associated with the dubia will remain in communion as the "controversy" at hand will give way to peace. Pope Francis is a holy man. The Cardinals in question are holy men. All involved are sons of the Church, whom they recognize and love as their spiritual mother. They are peacemakers. Unfortunately, on the right and left wings of the Church, there are those who have portrayed the dubia as an in-your-face challenge/attack directed at Pope Francis. The left-wing has portrayed the Four Cardinals as unmerciful, nasty men. The right-wing reacted with glee to the dubia, which they portrayed as a much-needed assault against Pope Francis. In particular, Cardinal Burke, who was attacked by the right-wing last April, as he insisted that Amoris Laetitia was orthodox, has been praised of late by the right-wing for his supposed challenge to "heretical" Pope Francis. Unfortunately, everybody makes mistakes. Cardinal Burke made a major mistake when, during an interview, he went far beyond the dubia via his comment about "correcting" the Pope. 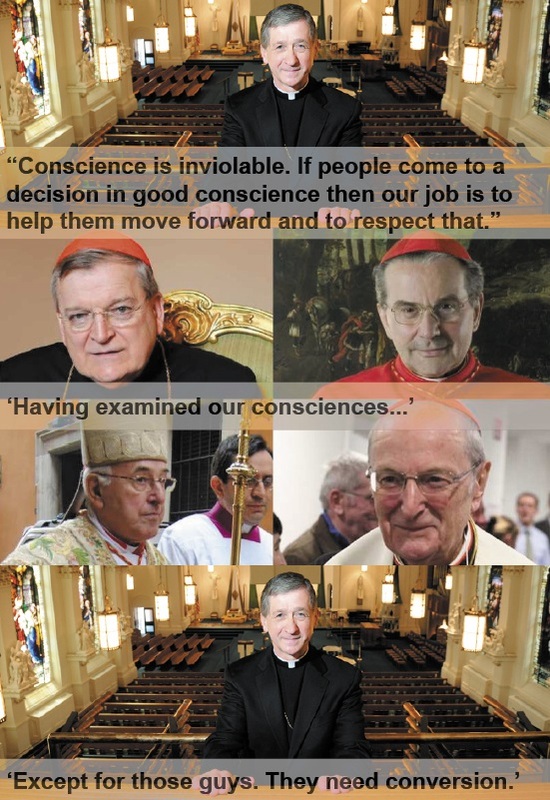 Cardinal Burke should not have issued that comment. The right and left wings of the Church seized upon said comment to portray Cardinal Burke as a man who is poised to denounce Pope Francis as a heretic. The left-wing has reacted harshly to said comment. The right-wing has throw a party as they are pleased that their wish will come true — that is, that the Cardinals will attach the "heretic" tag to Pope Francis. The right-wing is convinced that the dubia will lead to the denunciation of Pope Francis and schism, which, sadly, many on the right-wing believe will benefit the Church. The idea is that a formal schism will make it clear once and for all as to where everybody stands within the Church...one will choose clearly to stand either with orthodox or heretical Churchmen. I am hopeful that a schism is not in the offing. I am hopeful that Pope Francis and the so-called Four Cardinals will resolve things in peaceful fashion. I believe that Cardinal Burke, as he is the face and voice, if you will, of the dubia, will release a clear statement to indicate that he is 100 percent committed to remain in communion with the Vicar of Christ, Pope Francis. He has always maintained that position. But in light of the controversy that has erupted as the result of the dubia, Cardinal Burke, more than ever, needs to confirm that publicly. Our Lady of Fatima, whose 100th Anniversary is on its way, will intercede for us to prevent a schism. I believe that. Let us pray for peace between our Holy Father Pope Francis and the Cardinals in question. Thank you so much! I hope to hear more Catholics who are brave enough to say such words. Or disloyal. How can anyone hope for Salavation, if they attack the "sweet fountain pen of the Holy Ghost". "...peace between our Holy Father Pope Francis and the Cardinals in question." "in QUESTION"? Good one! So there WERE two comedians commenting on this post. A relationship between the individuals is not of course remotely the point. THE POINT is what the answer to their question is. The PROBLEM is that by anyone's reckoning, the pope has, in a very underhand manner, taught against the teachings of God. It's that simple. Mark Thomas: Francis is not a holy man nor a "Holy" Father and this is displayed and known by his public acts and works in the "name of the Church", and as such I am only speaking the Truth and per Canon 212 I have every right and even the duty to say so. Cardinal Burke is following Canon Law procedure for dealing with this situation to the letter, and as Cardinal, yes, he most definitely has the right and the DUTY to issue a Formal Act of Correction. It is way past time for all Catholics of good will to re-learn the True Catholic Faith, cling to Tradition only and leave aside the deception that has been fed to us for the past 60 years. Our souls depend on it. The situation is dire. I believe it is worse than the Arian crisis. We now need to look to St. Athanasius and study his actions during that time and imitate. Anonymous, we disagree in many ways in regard to His Holiness Pope Francis. That said, you are correct that in regard to Canon 212, the Faithful "have the right and even at times the duty to manifest to the sacred pastors their opinion on matters which pertain to the good of the Church and to make their opinion known to the rest of the Christian faithful, without prejudice to the integrity of faith and morals, with reverence toward their pastors, and attentive to common advantage and the dignity of persons." Canon 212 also states that "the Christian faithful are bound to follow with Christian obedience those things which the sacred pastors, inasmuch as they represent Christ, declare as teachers of the faith or establish as rulers of the Church." As Holy Mother Church teaches, we are to submit to the awesome authority, granted by God, that the Roman Pontiff possesses. Again, as Canon 212 makes clear, "we are bound to follow with Christian obedience those things which the sacred pastors, inasmuch as they represent Christ, declare as teachers of the faith or establish as rulers of the Church." God commands us to remain attached to His Roman Pontiff, Pope Francis. Otherwise, we will fall into grave sin of schism. Anyway, I remain hopeful that under the protection of the Blessed Virgin Mary, and, in particular, with the 100th anniversary of Fatima headed our way, Pope Francis and the "Four Cardinals" will maintain peace and communion with each other. As Catholics, we are brothers and sisters in Jesus Christ. Everything will be fine as long as we remain attached to God's great gift to us, His Papacy, and treat each other in charitable fashion. Let us entreat God, and call upon Our Lady of Fatima's intercessory prayers, to inspire Pope Francis and the Four Cardinals to maintain peace and communion with each other. We are all in this together as brothers and sisters in Our Lord Jesus Christ. Nic, one Cardinal and bishop after another has declared that His Holiness Pope Francis has not taught against the teachings of God. Examples: The holy bishops of Poland, Costa Rica, Alberta (Canada), Cardinal DiNardo, Archbishop Chaput, Archbishop Cordelione, Cardinal Mueller, and Cardinal Sarah (I could cite names all day) have declared that Pope Francis has upheld Church teaching. Nic, I renew my belief that Pope Francis and the "Four Cardinals" will maintain peace and communion with each other as all parties involved are men of God — holy sons of their spiritual mother, Holy Mother Church...the True Church...the Catholic Church. Arius also had the support of many prelates, and Athanasius was in the decided minority. But truth is not a numbers game. Interesting you should name Chaput - because his interpretation of AL is diametrically opposed to that of Cupich, Farrell and the Argentine squishops. So which of them is correct? It cannot both be "A" and "not A". Unless you ignore the law of non-contradiction. They say PF has upheld Church teaching on reception of communion by the divorced and remarried ("d/rm")? They may say it, but I have yet to see any of them demonstrate it, which is an entirely different kettle of piscis. Except for Chaput maybe, who simply "interprets" AL to not allow reception of communion for the d/rm despite its plain language to the contrary. He just simply refuses to interpret it as written. Happens a lot in the legal world where the legislature writes one thing, but the courts don't like it so they "interpret" it to mean the exact opposite of what it says. Although, you are probably correct. They will maintain communion - as long as it is politically expedient for PF to do so. I assume everything that 'Mark Thomas' says is an attempt at humour, but I fear we are moving beyond a time where that is advisable. If Mr Thomas was NOT joking, then, firstly God help him/you, and the only proper response was already made by 'c matt' : "truth is not a numbers game"